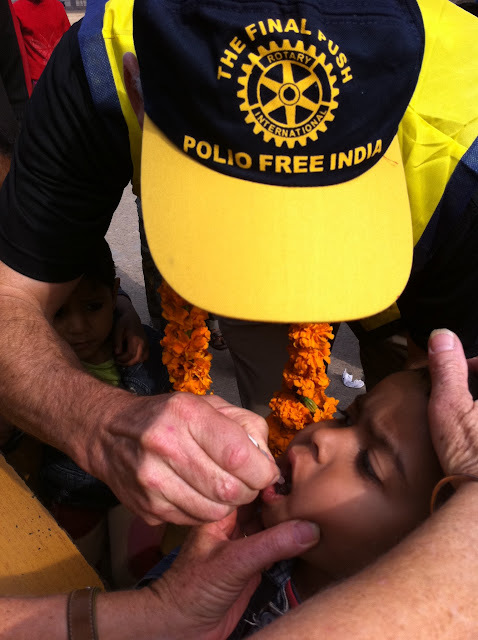 A few years ago, I assisted with a National Immunisation Day (NID) in Delhi, India that was an experience that changed my life! On the NID we were sent out to a school where families were being encouraged to bring their children for immunisation against Polio. The lines of people never stopped. I still get emotional just remembering how, when the eyes of a little girl who has probably never seen a white face before, connected with mine. Her eyes were full of fear at being bundled up by her brother into my arms, and for me those two drops not only changed her life that day, but they changed mine as well. You see my life changed because I had seen what a difference we can each make as Rotarians and it changed my life because I had engaged with Rotary. I was working to assist this little girl’s future away from a life which could have been very different if she had become a Polio statistic. This journey took us to the Polio Hospital in Delhi where we witnessed those who had not been immunised and the doctors who were doing their best to help straighten the bones of children who were otherwise unable to walk. We witnessed a boy who was able to take his first steps following his operation, so we were experiencing Polio face-to-face. The memory of that little girl again rose from my heart. I helped make a difference and I cannot describe to you how that has made a difference in my life. For me, the impact of being a part of placing the two drops in the mouths of those children and knowing that I was making a difference while working for Rotary will stay with me for the rest of my life. I encourage you all to consider donating your time and traveling with fellow Rotarians to make a difference in the world, as it will change your life. I still wonder about that little girl, where is she now, what is she doing. I will never ever forget her eyes. She will never know me, but she will always be in my Rotary heart.